In many cases people use their existing latches when replacing latch and privacy door handles. If they are in good condition this will normally be a reasonable course of action. It should be noted however that the return springs on door handles and the latch springs all work together. If your latch springs have failed or are weak, this will put extra strain on the handle springs, potentially leading to early failure. 1) Spring Strength: The first thing to consider is whether your handles incorporate springs, the majority do, but some handles are unsprung. If you have unsprung handles, all the return force needs to come from the latch itself, and in these circumstances it is necessary to use heavy duty sprung latches/locks. 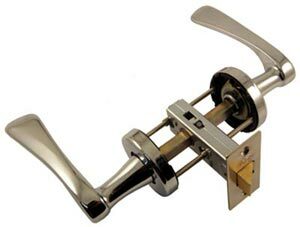 It is more common for handles to be sprung in which case standard sprung latches will be all that is required. Unsprung handles are identified in their website descriptions, so unless otherwise stated, you can assume that handle sets on the Door Furniture Direct website are sprung. Note: Fitting heavy duty sprung latches in conjunction with sprung handles will make the handle levers harder to depress in use. 2) Finish: Having determined the spring strength requirement, you can next consider the finish of the face plate and receiver plate. You will not necessarily get an exact match but something with a close match to your handle finish will look the best. 3) Size: You next need to consider the size and in particular the “backset” measurement. This is the distance between the face plate and the centre of the square spindle hole. This measurement determines how far in from the edge of the door your handles will be positioned. The overall width of your door and the depth of the rebate in the door frame may both be considerations in this. For standard interior doors using lever handles, the most common latch size is 2.1/2” or 63mm with a backset of about 44mm. Where knobs are used instead of lever handles it is likely that you would use 3” or 75mm latches with a backset of about 57mm to 60mm. This will place the door knobs further in from the edge of the door so that knuckles do not catch on the door frame when turning the knob. Whilst 2.1/2" and 3" latches are by far the most popular, longer latches are also available where these are required, on for example very wide doors, so that the handles are placed appropriately to give a good appearance. 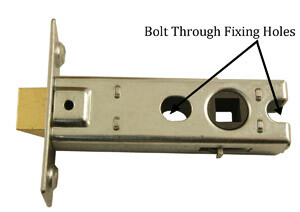 4) Bolt Through Fixings: A further requirement may be to consider whether bolt through fixing holes are required on your latches. Particularly in the case of knob handles, a stronger installation can be achieved by the use of fixings which pass through the door and in some cases these may require holes in the latch where the fixings pass through. 5) Fixing Requirements: If you are replacing old latches, face plate and receiver plate dimensions may also be a consideration because these will likely have been let into the face of the door and frame as part of the fitting process. You will ideally want the same size, but a larger size will cover up the old fixing area with a minimal amount of extra work to make them fit. A smaller size may require a little bit of filler to tidy it up.